Pictured (left to right) Joani Madarash, Jeff and Stephanie Stern, and Hans Zobel. On October 6, one hundred and twenty-five people, including seventy-seven golfers, joined School-Business Partnerships of Long Island, Inc. (SBPLI) as it held its 5th Annual SBPLI Golf Outing at Stonebridge Golf Links & Country Club in Smithtown. Golfers enjoyed a day of golfing, BBQ lunch, a reception, and dinner. The proceeds from the event benefitted SBPLI’s FIRST® (For Inspiration and Recognition of Science and Technology) robotics programs. 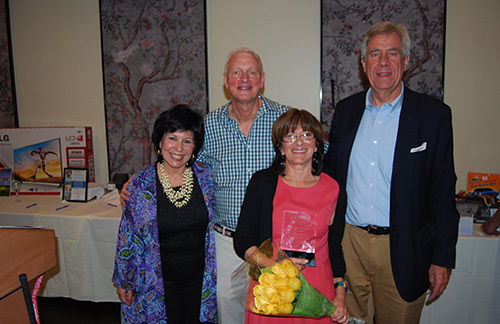 This year’s honorees were longtime volunteers Jeff and Stephanie Stern. The Sterns, who have had three of their four children participate in FIRST® programs, have been involved with SBPLI since the spring of 2000. Stephanie began her involvement in SBPLI as a coach for the Plainview-Old Bethpage High School FIRST® Robotics team and later became a member of the FIRST® LEGO® League Development Council, where she helped to grow the program from 13 teams to more than 110 teams over 10 years. She also helped to start the Jr. FIRST® LEGO® League (Jr. FLL) on Long Island for students ages six to nine. Jeff serves as an FLL judge, a sponsor and a staunch supporter of the teams. He recently joined SBPLI as a board member.